Torbay Coast and Countryside Trust have excellent facilities for school groups at Occombe Farm, Warren Barn and Berry Head however group visits can also be arranged to take place at Goodrington Beach and other sites around the bay for more information click here. Visits can be made to other Geopark sites around Torbay depending on the learning requirements of your group. If you have somewhere particular in mind for your visit, we are happy to discuss potential sites and activities with you. KENTS CAVERN - Offers an exciting tour of the caves which is specifically designed for school groups. Curriculum based worksheets are also available for your visit. Click here to visit the Kents Cavern education pages. 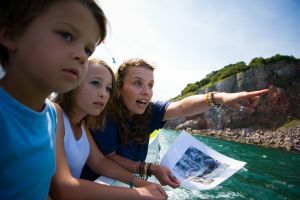 GREENWAY FERRIES - School groups are welcome on board for a cruise around Torbay to see the Geopark from a different perspective. Click here to visit the Greenway Ferries website. TORQUAY MUSEUM - Groups will have the opportunity to view and handle artefacts from collections including those that have been discovered right here in Torbay. Click here to view the Museum website. We are also able to offer combined visits beween some Geopark Gateway Sites which allows groups the opportunity to explore more of the Geopark during a single day. Please visit our 'Combined visits' page for more information.